When it comes to choose the right model of groom suits it is not difficult, but often people give more importance to the bride’s dress, maybe for the atmosphere of romance which surrounds it. Groom suits are equally important, and deserve the same attention, the first important rule is that they must be appropriate and in harmony with the environment and the wedding theme. In the previews article “How to dress for a wedding” we talked about the choice of a groom suit. When choosing a wedding suit, you should consider first the location and the time of the ceremony. Let’s see in detail how to choose a suit and some rules of good taste. If it is a civil marriage, for example, it is not required an excessively formal look. We recommend the use of a classic attire, as a two-piece suit. When the marriage is a more solemn ceremony, during daytime, the right choice is a tight, the morning dress with the typical black or dark gray jacket with long tails, light colour waistcoat and pinstriped trousers with pleats. The British elegance requires a white shirt with cufflinks, a silk tie or plastron and, according to tradition, gloves and top hat, with the obligation of the same look for groomsmen and the father of both groom and bride. If you want to play down the severity of the attire yet looking sharp, you should opt for a three-piece suit: two-buttons single breasted jacket without tails, trousers and waistcoat of the same fabric. A classic option but elegant, ideal for many occasions and remains useful after the wedding. If the ceremony takes place in the evening, with an elegant yet creative atmosphere, the choice can be extended not only to tuxedos in all its forms, but also to a satin or silk suit, with shiny effect fabric. The first rule is the fitting of the suit. It has to be perfect when worn. As for the jacket, you should avoid double-breasted models, tears, linen fabrics and mismatched suits, also avoid turn-ups trousers. The shirt always with French cuffs for cufflinks, can be white or ton-sur-ton if the dress is gray or blue. You should not choose button-down shirts and synthetic fabrics or silk, to avoid embarrassing sweat rings. Shoes and belt should be of the same colour and material. A classic choice is the black shoe laces Oxford model, but if the wedding is less formal, more casual brogues are appropriate too. Avoid buckles or moccasins, and socks aren’t less important. They should only be dark gray, black or blue. Avoid ties in bright colours, preferably classic in shades of blue or silver, plain or with tiny patterns. However, if you wear a bow tie or a lastron (the large knotted tie sometimes stopped by a brooch), they should exclusively be made of silk and be hand knotted. 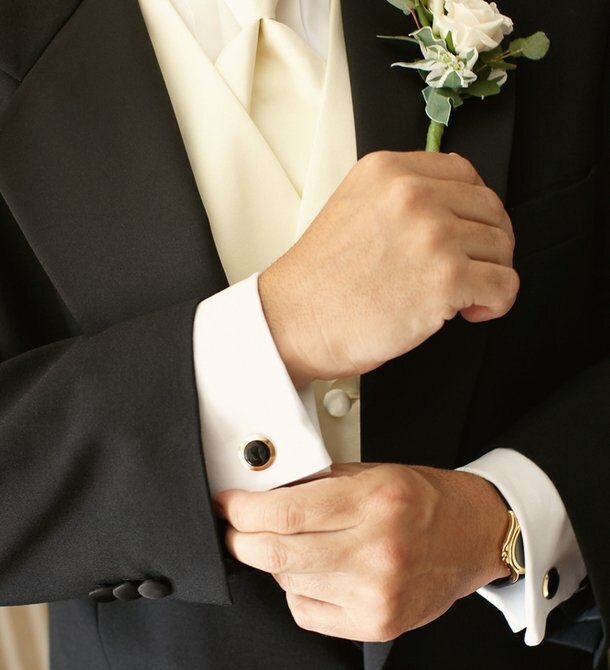 Also the choice of accessories must be accurate, especially cufflinks, symbol of male elegance, and unique jewellery allowed to grooms. They can even be especially created in harmony with the wedding theme. 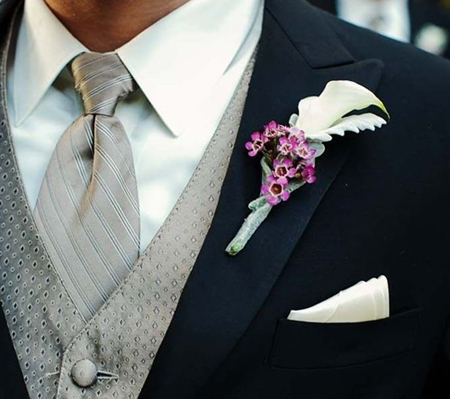 Pocket squares, in subtle colours, shouldn’t be matched with the tie, and for more romantic people the boutonnière, a fresh flower of course, maybe paired with the bride’s bouquet. Wedding colours: elegance and good taste must be basic rules for your wedding, so keep it simple, and avoid bold colours, as the boutonnière of a bright colour or a too loud tie. You can opt for a dark suit, charcoal gray or deep navy blue, or black, with some variations to shiny gray tones. Are you looking for your wedding suit? Comment and tell us your choices, your doubts and ideas!